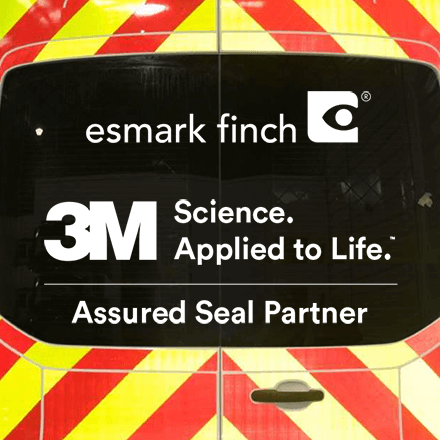 As Ireland’s only 3M Assured Seal Partner, we have the knowledge and expertise in vehicle graphics. When it comes to our reflective sheeting of choice we prefer to use 3M Diamond Grade™ DG3 material. Other manufacturers make similar sheeting however from our years of experience we have found that the 3M material gives a better long-term result. We understand that worker safety is of paramount importance during any road maintenance activity or works activity. 3M materials more than satisfy the requirements of Chapter 8 of the Traffic Signs Manual, which describes the conspicuity markings required for vehicles working on our highways. 3M is a global leader in traffic safety and retroreflective technology. With 3M materials you can mark your vehicles, protecting workers while increasing driver safety by preventing major accidents. 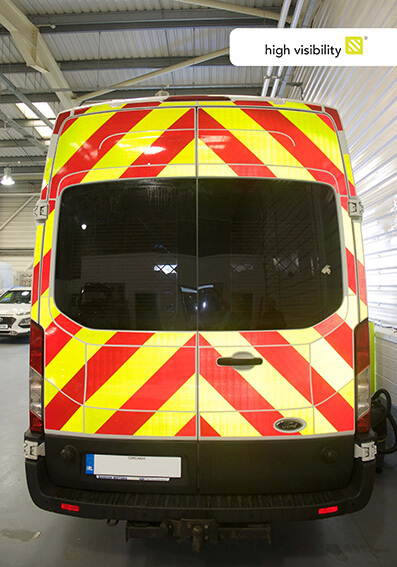 High visibility markings also help to prevent lesser accidents that can still result in high costs and vehicle downtime. Why should you choose 3M™ for your Chevron needs? 3M™ Diamond Grade™ DG3 Reflective Sheeting has been providing effective reflectivity for over 10 years. By utilising innovative full corner cube technology rather than older truncated cube technology, 3M have designed Diamond Grade DG3 to be optically efficient, reflecting around double the amount of light compared with traditional reflective material. The full corner cube technology in 3M Diamond Grade DG3 returns up to 58% of light back to the driver, making vehicles brighter and visible for longer even at high entrance angles where visibility is critical. 3M material is tough, durable and visible no matter the weather. All kits are edge sealed to stop water and dirt ingress. Other material such as Engineering Grade material does not meet the requirements of Chapter 8. The minimum requirement is Class RA2, Engineering Grade is only RA1. Diamond Grade exceeds the minimum requirement and can therefore considered the optimum solution. Diamond Grade™ DG3 is a high performance micro-prismatic reflective sheeting 3M’s innovative full corner cube technology allows more light to be returned to the drive. It returns up to 58% of light back to the driver, making vehicle liveries brighter and visible for longer.